Marco Rubio Jumps to Big Lead in 3 Way Race | Virginia Right! A strange thing happened to Marco Rubio on his way to a Republican Primary victory over Charlie Crist. Crist decided he would rather run as an Independent than lose the Republican nomination to Rubio. Admittedly, Crist was looking at an embarrassing primary loss with Rubio polling at 57% to Crist’s 28%. So, Crist did the only honorable thing a career politician can do when his own party no longer wants him – he quit the party. Instead of defecting all the way to the dark side and becoming a Democrat, Crist stopped in the twilight zone of Independent. The tactic seemed to work as polls indicated Crist jumped to a 38% to 34% lead over Rubio a couple of weeks ago. A new poll out today shows Rubio has turned this around and surges 12% in the polls and now leads Crist 39% to 31%. Marco Rubio is recognized by Florida voters as the real deal, while Crist is now seen as an opportunist willing to do or say anything to stay in office. Marco Rubio is a man of the people. He was born in Miami (and there is no doubt about this I am told) to parents who immigrated (legally) from Cuba. As a child, Rubio’s parents worked hard to make their way in the United States and instilled values and morals in their son. While his US Senate bid is on the hearts and minds of true Conservatives, this is one of the rising stars in the Republican Party and already the calls for Rubio for President have started. 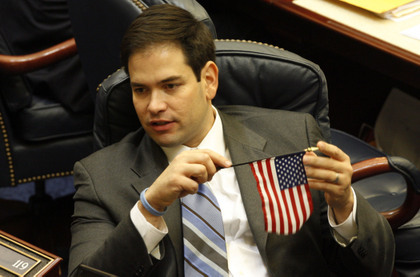 Please visit Marco Rubio for Senate and sign up for his email list. Or better yet, donate what you are able to help put a good, solid Conservative in the US Senate.